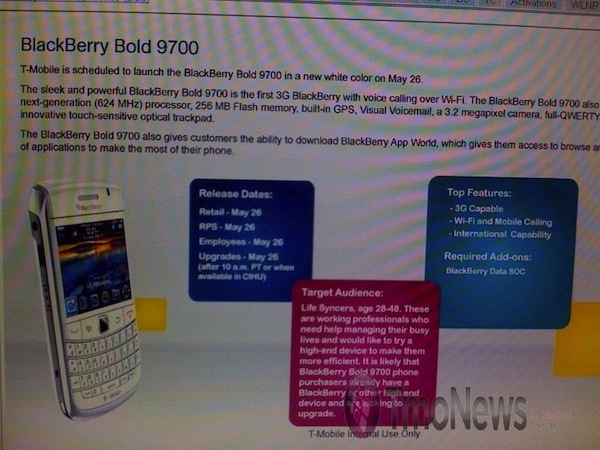 White Bold 9700 and Fuchsia Curve 8520 Heading to T-Mobile? Word on the street is that the Bold 9700 in white and Curve 8520 in fuschia will be landing on T-Mobile in the next few weeks. TmoNews posted the image above showing the white Bold should be arriving on May 26th, while some other intel informs us the newest addition to the 85xx series lineup should be popping up in the next few days. Rogers was the first to snag the new 9700, but if you're in the US and can't wait to get your summer style on in white, you hopefully won't have to hang in there much longer. Fingers crossed that we'll see the Pearl 3G in the coming weeks as well.